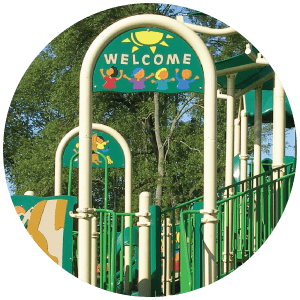 Polycarve® is a multi-colored HDPE material that enhances creativity in playgrounds, outdoor environments and sign and graphics applications by showcasing contrasting colors in the outside layers and core. With five standard color combinations and a central core color that becomes visible when routed, it offers a uniquely durable solution for artistic expression. For signage, it’s perfect for indoor use such as alert placards and directionals in high traffic areas, as well as outdoors for wayfinding and signage in marine, amusement park, golf course, resort, campground, city or neighborhood environment and more. Originally designed for playgrounds and skate parks, the superior UV performance and weatherability of Polycarve® stand the test of time and vigorous use. Access the Playboard® Polycarve technical information now!